Loosely speaking, thatching is the use of straw or grasses as a building material. 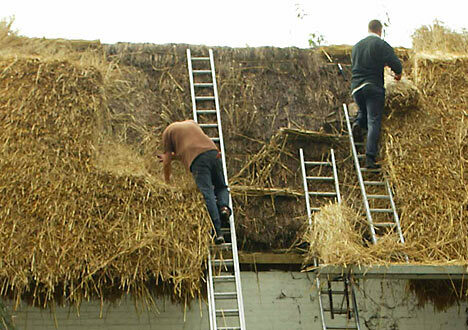 Using thatch for roofing goes back as far as the Bronze Age in Britain. At Shearplace Hall in Dorset there are remains of a round hut that shows signs of thatching. Thatched cottages and farm buildings were the norm in rural Britain for a millennium or more. Why the attraction to thatch? First of all, the building practices of bygone Britain ran to lightweight, irregular materials, such as wattle and daub walls, and cruck beams. These walls were simply not made to take much weight, and thatch was by far the lightest weight material available. The study of materials used in thatch buildings can get pretty obscure, but basically, people used whatever was available locally. This meant materials as diverse as broom, sedge, sallow, flax, grass, and straw. Most common is wheat straw in the south of England, and reeds in East Anglia. Norfolk reed is especially prized by thatchers, although in northern England and Scotland heather was frequently used. Although thatch was primarily used by the poor, occasionally great houses used this most common of materials. In 1300 the great Norman castle at Pevensey (Sussex) bought up 6 acres of rushes to roof the hall and chambers. Much later, in the late 18th century thatched cottages became an extremely popular theme with the “picturesque” painters, who tried to portray an idealized (Romantic/sanitized) version of nature. Churches also used thatch frequently. In one humorous episode the parish church at Reyden, near Southwold, was roofed in 1880 with thatch on the side of the church hidden from the road, and with tiles on the side facing the road. Presumably the tiles looked more elegant than the more commonplace thatch. What caused the decline of thatching? Primarily better transportation. The growing railway network in the Victorian era meant that cheap slate from Wales became easily available all over Britain. Agricultural machinery, particularly the combine harvester, had the unfortunate effect of making wheat straw unusable for thatching. This made Norfolk reed all the more prized, and now the latter material is grown specifically for use in thatching. So how does one thatch a cottage? First the thatch is tied in bundles, then laid in an underlayer on the roof beams and pegged in place with rods made of hazel or withy. Then an upper layer is laid over the first, and a final reinforcing layer added along the ridgeline. It is at the ridgeline that the individual thatcher leaves his personal “signature”, a decorative feature of some kind that marks the job as his alone. One lovely cottage I saw on a bicycle tour near Glastonbury (Somerset) has a row of thatch birds marching proudly along the ridge of the roofline! Although thatching, like many rural crafts, has suffered from the encroachment of “civilisation”, many property owners today recognize the value of keeping their cottages thatched, if for no other reason than that thatched cottages fetch a prime price on the real estate market! Well thank goodness, for those of us who love traditional British architecture! Sure, it is “corny” but to this anglophile North American at least, nothing says “Great Britain” so much as the sight of a beautiful whitewashed cottage, a blooming rose bush climbing a trellis beneath a roof of weathered thatch. Long live the thatcher! 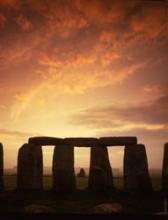 There are more thatch work in Wiltshire than any other county in Britain. Join us on a private tour of Wessx and learm more about the history of this tradional craft.